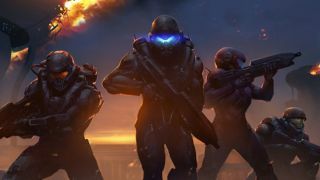 Speculation around a TV spin-off for Halo, one of the most iconic gaming franchises of our time, has been swirling for years, but we've not heard much about the project lately. Now Microsoft has told AR12Gaming that a show is indeed still in the works. "Progress on the Halo television series continues," says a Microsoft spokesperson. "We want to ensure we're doing this the right way together with a team of creative partners... that can help us build the best Halo series that fans expect and deserve." Those "creative partners" are Showtime and Steven Spielberg, who's been attached to the series from the very beginning. We don't have any more details, or anything like a release date, but the project hasn't been killed off yet. Apart from sporadic confirmations that the Halo TV project is still alive in some form, we haven't heard much about it from either Microsoft or its subsidiary, 343 Industries, which is tasked with making the show. The scope and story of Halo would seem to lend itself well to television, though of course it all depends on how it's done. Way back in 2013 the team said the Halo television series would be inspired by the likes of Breaking Bad, Band of Brothers and Game of Thrones, and if Microsoft manages to create a show with half the heft of those blockbuster programs then it'll be very satisfied. TV has changed since 2013 of course, with Netflix pushing its original programming and even Apple getting in on the act. Maybe the time is now right for Microsoft to ramp up production on Halo the TV series – we wouldn't advise holding your breath for news anytime soon, but the project is still alive at least.